Waterton Glacier International Peace Park is known for its superlative mountain scenery of glacial origin. Located on the border between Canada and the USA, Waterton Lakes and Glacier national parks form the world's first International Peace Park since 1932. Among its recorded plusses are a unique geological feature in the form of the Lewis overthrust. There are also superb examples of Precambrian rock formations, six species stromatolites (fossil algae) and 98% of the world's remaining stock of genetically pure Westslope Cutthroat Trout. There have been three evaluations of a proposals of this site. Reservations were expressed and the site was rated as of secondary importance. It duplicates many values that can be seen in the Canadian Rocky Mountain Parks. I visited the Canadian side of this WHS. I stayed at the town (tourist resort) of Waterton for 3 days, which was a perfect amount of time to me. The park is pretty compact, and your range to see and do things is limited of course due to the border with the USA. The particular reason for becoming a WHS is not so clear and it will obviously have much in common with the Canadian Rockies which are just a bit to the northwest from here. It is said though that wildlife is still more abundant here in Waterton Lakes NP and there are less tourists, a conclusion that I can agree with after having visited Banff & Jasper. Three sights stood out for me here: Bison Paddock, Red Rock Canyon and Bertha Lake. The Bison Paddock is a loop road located just before the official entrance to the park. It's a bit like being on a safari: the narrow road winds through a grassland area, which has iconic views for this park "where the mountains meet the prairie". At the far end I encountered the group of American bison that have been reintroduced here. Red Rock Canyon lies at the end of a parkway that is known for its wildlife sightings in the early evening. But I had to work hard to see any! At my first try, I saw some female bighorn sheep at the Red Rock Canyon parking. They went on to climb about at the red rocks of the canyon itself, a great sight. I drove this entire parkway twice more, once every evening that I stayed in Waterton. It's a pretty drive anyway, but you want to see some big animals of course. 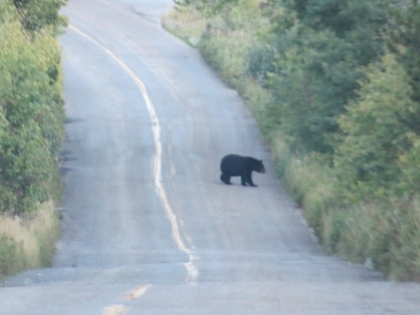 I finally succeeded on the return drive of my third try: I saw two black bears at different spots. The first one was crossing the road in front of me, the second one was running across the grassland. Never seen a bear running before, they jump like long-jump athletes and are very fast. I hiked up to Bertha Lake, and circled this beautiful pristine mountain lake. This is a full-day hike, 17km including the detours and the walk back to the hotel in town. I was the first on the trail, and later encountered only a handful of other visitors near the lake. Most people seem to do this walk only to Bertha Falls, which is about half-way but skips the steeper but prettier section. The lake has a few pebbled beaches, but is mostly surrounded by forest. To circle it in its entirety takes 4km. I was happy to do this, it's a fine narrow trail and the weather was perfectly sunny. Combined with few other people around, these were perfect hiking circumstances. The Rockies are a happy place for me, and Waterton-Glacier International Peace Park was the highlight of my summer travels. 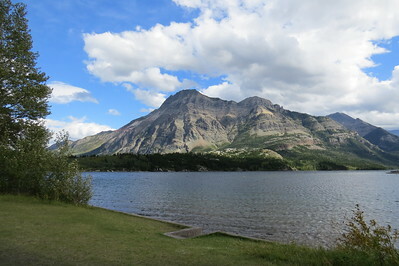 I spent two days in Waterton Lakes, in Canada, and enjoyed the laidback attitude of the park. Unfortunately, wildfires in 2017 had closed many of the park's trails, but I was still free to walk around the town of Waterton and the surrounding countryside, which were covered with wildflowers. On Canada Day, I enjoyed the morning parade, complete with bagpipers and Mounties, and in the afternoon, I took the boat tour down Waterton Lake and across the US-Canadian border to the peace pavilion on the US shore of the lake. After a relaxing couple of days in Waterton, I crossed the border to Glacier National Park in the US. The eponymous glaciers have been retreating, but the U-shaped valleys in the park show their former size. I took a Red Bus tour of the Going-to-the-Sun Road, which was an excellent way to avoid the crowds that fill the parking lots during the summer. The tour is conducted in original park tour buses that have been in operation for over 80 years, which added to my enjoyment of the tour. I also made sure to get some hikes in at Glacier, enjoying the scenery of lakes and waterfalls. I highly recommend the Rockies to all North American visitors. Logistics: Private transportation is recommended, and passports, and potentially visas, are absolutely necessary to visit both parks completely. If you do only travel to Canada, you can step foot in the US without need of a passport/visa if you take the boat tour down Waterton Lake. Nevertheless, to travel any further into Glacier and the US, you'll need a passport for the border station once you leave the lakeshore. I traveled through the Canadian part of Waterton Glacier International Peace Park in the summer of 2015. I stopped at the iconic Prince of Wales Hotel. I might have been expecting it to be a bit more old fashioned when it came to the building material, but the wood and paint was rather new. It wasn't bad, but not what I was expecting. I then took a ferry across Waterton Lake to the Crypt Lake Trailhead. The Crypt Lake trail is about 11 miles round trip, and you gain roughly 2,300 feet in elevation. The hike starts out in a pine and aspen forest, and gradually reaches the alpine tundra and exposed rock fields. I got back to the ferry and soaked my feet in the frigid waters of Waterton Lake. I then drove to Red Rock Canyon. The canyon was interesting, but the drive there was much more eventful. I saw three black bears foraging for food. The canyon was interesting, but I had seen similar canyons in other national parks. 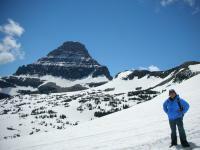 I enjoyed my time in Waterton Glacier International Peace Park, and I would definitely add it to your travel plans. Going To The Sun Road is amazing! Just please drive in your own lane. People have a tendency to crowd the line when they are on the sheer cliff drop side. lol. It IS QUITE a drop. We stayed inside the park for our 25th anniversary. Nice clean affordable rooms. The food at any of the restaurants is nothing to write home about and is expensive but meeting friendly wait staff from all over the world more than made up for it. I would go any time I had the chance as it is different looking with the seasons and weather conditions. But DO CHECK beforehand to make sure it is open. Certain years the road never opens at all. Though that is unusual. The weeping wall is a treat that is best viewed during Spring thaw as another trip later in the year there was no moisture at all. All of us had the impression of viewing Jurassic park (minus the dinos)the time we visited in rain. You can drive it or hike it and a boat trip on one of the lakes is relaxing and fun, especially if you get a guide as friendly as ours was. Our boat was drag portaged in the winter on the frozen lake by college students for a keg of beer years ago! Bring extra batteries and cam cards. You can't take at bad picture at Glacier. Waterton National Park is quiet uncrowded. It is a perfect place to have a view of the spectacular scenery, wildlife and enjoy outstanding recreational opportunities. The uniqueness of this park is the blend of unusual geology, mild climate, rare wild flowers, and abundance of wildlife. World is changing by time but the beauty of the waterton national park has remained unchanged for centuries. 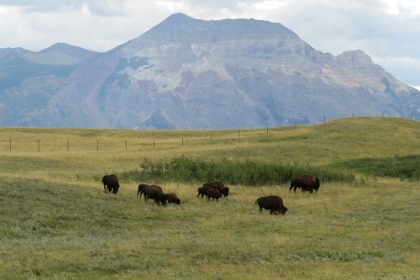 The Wilderness experience in Waterton Lakes National Park is one of the best in the world. 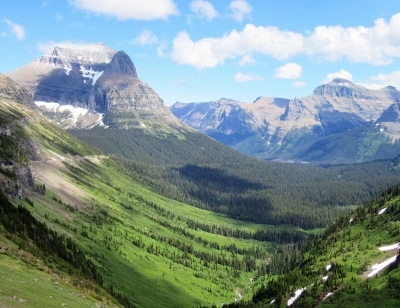 The spectacular unspoiled wilderness of Waterton Park offers users superb opportunities for solitude, personal and physical challenge, freedom and adventure. At the Waterton National Park's visitor centre, we were told that two of the most scenic drives are along the Akamina and Red Rock Parkways. The Akamina Parkway begins at Waterton Townsite and runs 10 miles along Cameron Valley with views into Cameron Creek. The parkway ends at Cameron Lake, which had a snowy mountain in the background. It was beginning to rain and very windy so we didn't stay long. Red Rock Parkway is 9 miles long and runs along the prairie. The park's highest peak, Mt. Blakiston (9580 ft.) is seen here. We also saw many samples of red rocks but were disappointed not to see any wildlife, which is said to be common in this part of the park. A new exhibit has been built in the marina and it is here that you will find the World Heritage Site plaque. It's in a hidden corner and the exhibit, which I found odd, but I was happy to locate it anyway. The Prince of Wales Hotel is worth a visit. It is a grand chalet-type establishment with a beautiful view of Upper Waterton Lake and snow-capped mountains. It was on the premises of the hotel that we spotted our first mule deer. We camped at Glacier National Park (in Montana) for two nights and absolutely fell in love with the place! The Going to the Sun Road is worth the drive, although we could only drive up to Logan Pass, due to a rock slide the had taken place the day before. 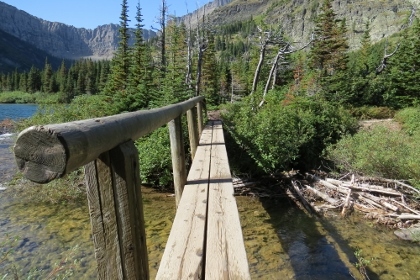 If you are up for a challenge, hike along the Hidden Lake trail (pictured above), which is 1.5 km each way. It is challenging because you are not only hiking on snow almost all of the way, but you are also on the side of a mountain. I was proud of myself for having completed the trail without injuring myself. I think hiking boots are a must for this, but my husband managed to do the hike in his sneakers without feeling any kind of discomfort. In the parking lot of the Logan Pass Visitor Centre we saw our first bighorn sheep, 5 of them. Lots of people had their cameras to take pictures of the sheep. Some of them were too close, I thought, but no one was harmed. During our stay in the park, we also saw moose, mountain goats, a beaver, and coyotes. Another hike we enjoyed was to Redrock Falls, which was much easier than Hidden Lake. This is the place where we saw a mother moose and her two calves. I started to panic about coming face to face with a bear but it didn't happen! I can recommend both of the campsites where we stayed, Rising Sun and Many Glacier. When you wake up in the morning and get out of your tent, the mountains greet you and it is an indescribable feeling. One place to eat that I highly recommend is the Park Cafe in St. Mary, which had excellent choices of salads and buffalo burgers and is famous for its homemade pies. If you leave Glacier to return to Waterton, stop in Babb, Montana at The Babb Press for a meal. We enjoyed their "presses" (toasted hot sandwiches) and their vegetable soup. I guess that the “International Peace Park” aspect appealed to the UNESCO committee (the US part is 8x as big as the Canadian) though that doesn’t feature specifically in the 2 purely “natural” criteria on which inscription was based. Reading the 1995 IUCN report after the third nomination attempt by USA/Canada you can almost feel the arms being twisted to accept it - “All 6 external reviewers expressed reservations over the merits of the proposal” followed by a long discussion about what is meant by “Universal outstanding value” which certainly doesn’t convince that this Park meets it. Mention is also made of the fact that the US has included 9 other sites from the “Western Cordillera” in its Tentative List. Nevertheless the Park apparently contains “98% of the world’s remaining stock of genetically pure Westslope Cutthroat Trout” so perhaps it is of “Universal Outstanding Value” after all! Has featrures already on list. Better if linked to Waterton in Canada. But Waterton is not on Canada's Tentative List! Canada indicated it would add it! Access from the Canadian side is best via flying into Calgary Airport, and then drive southwards for ca. 250 km. Late Pleistocene: The geologic event that would define the landscape began with a global cooling trend approximately 2 million years ago. Named after individual people: Waterton Lakes NP was named after Charles Waterton (June 3, 1782 - May 27, 1865), an English naturalist and explorer. Fatal Accidents or 'disasters': Glacier NP reports 9 fatal bear attacks since the 1960s. Extended from original TWHS: Originally only the American part. A transnational proposal followed a deferral of the original nomination in 1985.